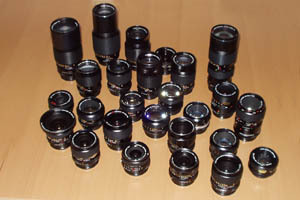 A list of Konica lenses for the SLR system can be found on the lens overview. From there you can go to the informations on specific lenses. 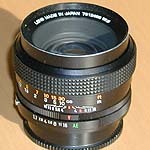 You won't find informations about third-party lenses for the Konica mount on this page, as this would overstretch its limits. 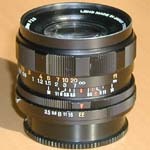 For informations about third-party lenses, a glance at the Medium Format Photography Megasite is always worthwile. Over the years, Konica had extended their lens line-up to meet professional demands. From fisheye to extreme long telephoto lenses everything what a photographer desires was available in the mid-70s – most of the lenses in outstandig quality, optically and mechanically alike. When the new AR bayonet was introduced with the Auto-Reflex in 1966, things were different. The available range of lenses was not broad enough to meet professional demands back then. This might have been one of the reasons why Konica chose to stick with the small 40.5 mm flange-film register of the F bayonet when designing the AR bayonet, thus having the possibility to mount lenses of other manufacturers to the Konica bodies with simple, mechanical adapters. From Konica, such adapters where available for the widely used M42 thread mount, for Nikon, Exakta, and the old Konica F bayonets. 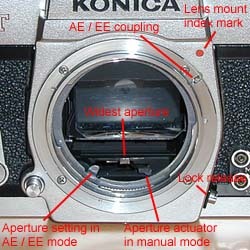 Lenses for these systems can be used on Konica bodies from the Auto-Reflex on, but the aperture has to be closed manually prior to exposure. Sadly, this decision for the small flange-film register had the effect that Konica lenses only be used on very few camera bodies of other manufacturers with simple, mechanical adapters – or at least cannot be focussed to infinity (∞) on these bodies. As almost all other SLR systems – apart from the early discontinued Miranda system and the rather exotic Alpa system– have a longer flange-film register than Konica, the Konica lenses can almost exclusively be used on Konica bodies. Despite the outstanding mechanical and optical quality of most Konica lenses it was therefore nearly impossible to sell the lenses to users of other systems. The lens line-up has been continually developed over the years. New lenses were introduced, others were discontinued, lenses were redesigned, different coatings were used and so on. Due to this, there is a big variety of models and variants. A rough division can be made with the bayonet versions and the exterior characteristics. Most of the Konica lenses have a fiter thread diameter of 55 mm, so that filters are needed only in one size. There are a few exceptions, however, especially with fast telephoto lenses. Lenses for the F bayonet fit the bodies prior to the introduction of the Auto-Reflex. They don't fit all later camera bodies and can only be used with the respective adapter on those. There are two variations of the F bayonet – one with a coupling for the aperture set on the lens to the light meter of the Konica F and one without this coupling for all other Konica SLR bodies of the F series. As far as I know, lenses for each variation can be used on the other variation as well, but I'm not absolutely sure about this. Certainly the coupled light meter of the Konica F will not work properly with lenses that don't have the coupling lever for the aperture value. All standard lenses and later versions of most other lenses have a so-called fully automatic aperture, meaning that the camera body closes the aperture just before exposure automatically to the value that has been set manually on the lens before. Many of the early lenses still have a fully manual or preset aperture, the aperture has to be closed manually prior to exposure. Preset means that the aperture value can be predefined on the lens – the aperture ring has only to be closed as far as it goes, so after focusing you do not need to take the camera off the eye once again to set the aperture correctly. Fully manual means that the correct aperture value has to be set exactly on the lens just prior to exposure. With the Auto-Reflex, the new bayonet with a larger diameter was introduced in 1965. The Auto-Reflex does not yet meter through the lens (TTL metering), so the camera's light meter does not need to know the widest aperture of the lens mounted. For all later camera bodies with TTL metering this is important though, otherwise the light meter cannot give correct values. For the TTL metering feature of the Autoreflex T, the new bayonet has once again been changed two years after the introduction, an additional coupling for the widest aperture was added to the lenses. 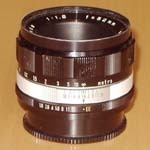 Lenses which have this coupling fit on all Konica SLRs from the Auto-Reflex onward, including the Auto-Reflex – whichever variation they may be. The early lenses built for the Auto-Reflex and missing that coupling are not suitable for bodies with TTL metering (all from Autoreflex T onwards), as the light meters of these camera bodies do not provide correct exposure values with these lenses, so automatic exposure cannot be used. Stop-down metering is also impossible, as the EE lens's aperture is kept open by the camera body. The coupling can be retro-fitted, however – Konica themselves did this free of cost for their customers back in the late 60s, which is one reason why there are so few lenses with the early version of the AR bayonet on the market nowadays. But from today's point of view the retro-fitting does not make much sense. The old lenses are probably more valuable if in original condition. The later lens versions already having the coupling are more easily found and tend to have better coatings, so that the purchase and retro-fitting of an old lens is not worth the effort – it is better to purchase a newer version that does provide the coupling already. On bodies with the old F bayonet, lenses with the newer AR bayonet cannot be used. The lenses with the older F bayonet are almost all marked Konishiroku Hexanon. Only the 52 mm / F1.8 and 52 mm / F1.4 standard lenses that have been distributed in Germany by Foto-Quelle with camera bodies under the Revue brand are marked Hexar. The focusing ring is made of splined metal. The lenses have a chromed ring with the depth-of-field indices. The distance scales are on a separate metal ring that is spanned around the lens and fastened to the lens barrel with a screw at each end. 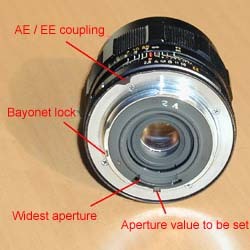 The aperture ring is mostly on the front end of the lenses, not on the body side. They do not have a mechanism for the transmission of the aperture value, the coupling just closes the aperture to the value manually set on the lens. 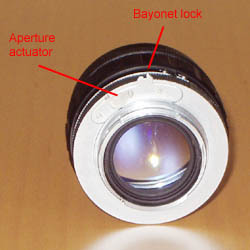 Different from the later AR bayonet lenses, the aperture stays completely open when the lens is taken off the camera body with automatic aperture lenses. There are some preset or fully manual lenses without automatic aperture, that means the aperture has to be closed manually prior to exposure. With the Auto-Reflex, the new AR bayonet was introduced in 1965. Externally, the matching lenses are quite similar to the models for the older F bayonet, like these they have a splined all-metal focusing ring and a chrome ring with the indices for depth-of-field. They are now marked Konica Hexanon instead of Konishiroku. Different from the predecessors they have a coupling for the aperture that allows for automatic transmission of the aperture value from the camera body to the lens and an EE position for automatic exposure on the aperture ring without lock. There are some exceptions with long telephoto lenses that are preset and do not have the EE position, though. EE stands for Electric Eye. With the introduction of through-the-lens metering (TTL) in the Autoreflex T in 1968, it became necessary that the widest aperture of the mounted lens is known to the camera body. 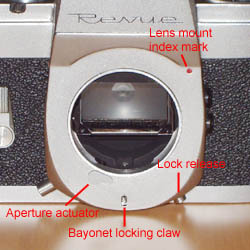 The bayonet has been extended with a lever at the camera body that is actuated by a pin or metal fin on the back side of the lens. Early specimens are marked Hexanon, later the lenses were marked Hexanon AR. The style of the inscriptions has been changed, the black finishing is less glossy than before. Apart from this, they look like before, still have the splined all-metal focusing ring, chrome ring and EE mark on the aperture ring, which now locks in EE position. Konica provided cost-free retro-fitting of the coupling, so even lenses from the Auto-Reflex era can have it today. During the construction era of the Autoreflex T2 from 1970 to 1973 the chrome ring has been dropped on the lenses. They are now all black, but still mostly have the splined, all-metal focusing ring and a yellow EE mark on the aperture ring. The lenses are now all marked Hexanon AR. At the same time, the first lenses appear on which the splined, all-metal focusing ring was replaced by the newer focusing ring with rubber inlay with checkered pattern. These new focusing rings could be produced cheaper and were optically not as stronly affected by use as the blackened metal. These changes were not made simultaneously on all lenses – on one hand, there are many lenses which are all-black already, not having a chrome ring, but which still have the splined, all-metal focusing ring (i.e. with 21 mm / F4, 28 mm / F3.5, 35 mm / F2 and F2.8, 52 mm / F1.8, 57 mm / F1.2 and F1.4). On the other hand, there are some lenses which still have a chrome ring, but already have the new focusing ring with checkered rubber inlay (i.e. can be found with Macro 55 mm / F3.5, 135 mm / 3.2, 200 mm / F3.5 and 300 mm / F4.5). Some time in 1973, the colour of the EE mark was switched from yellow to green on some lenses. Then, in early 1974, Konica started to replace the EE mark on the aperture ring with AE (for Automatic Exposure). Green EE markings seem to be rare, however. I'm not sure they exist on all lens types available at the time; I only have seen it on 24 mm / F2.8 and 50 mm / F1.7 lenses so far. Others seem to have changed from yellow EE to green AE markings directly. Most lenses are now marked Hexanon AR, but a series of entry-level, cheaper lenses made by third-party manufacturers are marked Hexar AR. From 1976 onwards – with introduction of the Autoreflex TC – some lenses have been redesigned to become smaller and lighter. With this redesign, the click stops for half aperture values have been dropped because Konica assumed the users to use more and more the automatic exposure. The index marks for depth-of-field on the lenses have been simplified, some values have been left out. The lenses are marked Hexanon AR now. After the introduction of the FS-1 in 1979, a smallest aperture of 22 was integrated into many lenses. But not every lens has been reassigned accordingly, some kept their smallest aperture 16 until the end of Konica SLR production. On some redesigned and newly introduced lenses, the round button for the AE lock has been replaced by a long, rectangular button. The index marks and scales on the lenses, that used to be engraved and filled with ink, have been changed to printed only. The lenses are marked Hexanon AR. 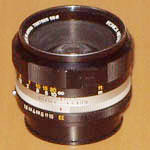 With the introduction of the FT-1 and the TC-X in 1983, some completely new lens designs were introduced. These were no longer made of metal, but entirely made of plastic. This can be seen at the focusing ring, that is plastic with checkered pattern instead of the rubber inlay that was used before. These lenses are also marked Hexanon AR. Starting from approx. 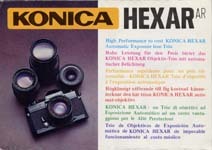 May, 1972, Konica Hexanon and Hexar SLR lenses were marked with a production code, showing the production time of the individual lenses. It seems that at this time the change from chrome ring to all-black lenses was already completed. At least I have never seen a chrome ring lens having such a production code so far. The codes were originally printed on the back side of the lens, with white ink. In the last years, Konica used black ink instead. The production code always consists of a single digit followed by a single capital letter. The digit represents the year of production, the capital letter shows the respective month. The decade is not mentioned explicitly, so a »2« can signify 1972 or 1982, respectively. In this era, the Konica camera bodies wear the same production codes, embossed into a Sakura Film sticker, which was typically put on the inside of the camera back. With camera bodies from Germany, these are frequently covered by a sticker from the importer and sales partner Carl Braun Kamera-Werk. The Hexar AR lenses were of simpler construction than their respective Hexanon AR counterparts. They are very sturdily built, but a lot larger and heavier than the Hexanon AR lenses. Optically they are decent performers, but they can't keep up with the Hexanon AR lenses of the same focal lengths. All Hexar AR lenses exist only in one version. They all have the focusing ring with rubber inlay, a green AE mark, no clicks for half aperture values, and a smallest aperture 16.